Those small joints located in front of your ears are actually called the TMJ, and they are what allow your jaw to move smoothly whenever you eat, speak, laugh, or yawn. Like other joints in the body, it can sometimes suffer from stress or injury, leading to what is called a TMJ disorder, or TMD. A TMD can bring on a variety of unpleasant symptoms, including a stiff and painful jaw, frequent migraines, earaches, and even unconscious teeth grinding. Dr. Swearingen can provide relief for these kinds of issues right here in Oklahoma City, so if you’re ready to stop the pain NOW, contact us today. A TMD can be caused by several things, with the most common being stress, injury, arthritis, and a misalignment of the bite. 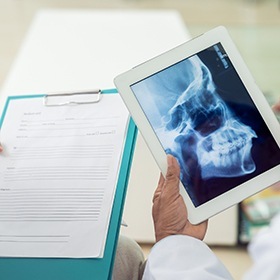 Determining the root cause of your TMD will help us figure out the best way to treat it, and to do this, Dr. Swearingen will perform a number of tests and take some scans of your jaw. Afterward, he’ll go over your treatment options that should be able to relieve your pain in no time. 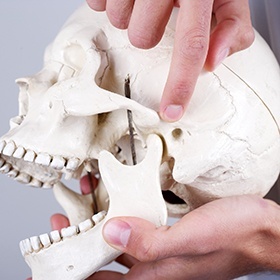 Even a slight misalignment of the bite can cause the jaw joint and muscles to make small adjustments whenever you open and close your mouth, and these can actually put quite a bit of strain on them, leading to tension and pain. To help correct this, we can slightly reshape a few key teeth so that they come together properly, allowing the joint to move how it is designed. This should make the pain lessen and go away over time. An occlusal splint is a custom-made oral appliance that a patient wears to bed, and it works by slightly shifting the jaw so that it is in a more natural and relaxed orientation. This device can also protect the teeth from unconscious grinding, which is very common for those with a TMD. Over time, any pain should be completely relieved, and some patients are even able to stop wearing the appliance after a certain time.